Nestling amid mountain scenery, the Grand Resort Bad Ragaz is situated in the Heidiland holiday region of Eastern Switzerland, just an hour’s drive by car from Zurich. The Grand Resort Bad Ragaz is regarded as the leading wellbeing and medical health resort in Europe. Most recently, the Spa Guide published by the well-known Condé Nast Traveller (UK) awarded the five-star resort the accolade of “Winner Best Medi Spa”. The Grand Resort is also proud of its total of 58 GaultMillau points and 1 Michelin star. The resort consists of two five-star establishments, the Grand Hotel Quellenhof & Spa Suites and the Grand Hotel Hof Ragaz, the 36.5° Wellbeing & Thermal Spa, two golf courses, the Kursaal Business & Events Center and an in-house casino. 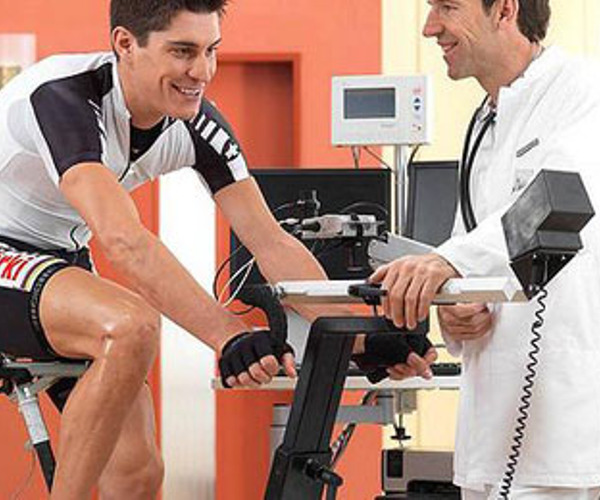 Complementing the wellbeing and recreational facilities is the internationally renowned Medical Health Center, a byword for preventive care and rehabilitation of the highest order, as well as the Swiss Olympic Medical Center, to which famous sportspersons come for treatment. Feeling good in your own skin, being at one with yourself and your environment – that’s the philosophy of the 36.5° Wellbeing & Thermal Spa. The 5,500 square metres of the “Leading Spa of the World” are dedicated to wellness at its very finest. Guests can relax with soothing massages and facials or in the saunas and steam baths. A particular highlight is the herbal steam bath with its Swarovski crystal decorations. In the Beauty & Care, guests are pampered with high-quality, intensively nurturing luxury products such as La Prairie, Kanebo, Sisley, Carita, Ericson and Niance. Sportsmen and women train in the Body & Sport, a fitness studio where a personal coach may be booked for individual training sessions by prior arrangement. The extravagant Private Spa appeals especially to couples. They get to enjoy exclusive use of its 100 square metres with sauna, steam bath, whirlpool, garden, cuddle recliners and champagne cooler. The Tamina Therme is renowned for the healthy thermal spa water that rises from the Tamina Gorge at a temperature of 36.5 °C. The newly built, futuristic wellness landscape extends over 7,300 square metres and is equipped with various indoor and outdoor pools, numerous whirlpool recliners, whirlpools, a waterfall and a current channel. At 12,800 square metres, the Grand Resort Bad Ragaz’s wellness area is one of the largest in Europe. In the Medical Health Center, an integral part of the resort, some 70 specialists in ten disciplines look after the guests’ wellbeing. The services range from weight loss or burn-out programmes to check-ups and beauty treatments as well as preventive medicine. The included Swiss Olympic Medical Center, headed by Dr. Christian Schlegel, not only looks after elite athletes from all over the world but also after hotel guests. In the elegant setting of the Kursaal, every celebration becomes an unforgettable occasion. Be it a wedding, a birthday party or a conference: meetings for up to 300 persons can be held thanks to the multifunctional interior design, the new conference facilities and flexible space concept. The Grand Resort Bad Ragaz is the only hotel in Switzerland with its own 18-hole PGA Championship course – a magnificent amenity with mature trees, ponds and streams. The 9-hole Executive Course with driving range and golf academy round off the facilities. Guests will encounter a wealth of diversity not only in the in-house casino, but also in the surrounding Heidiland holiday region with its richly varied leisure opportunities. These extend from hiking, Nordic walking and biking to riding, hang gliding and adventure trekking as well as winter hiking, cross-country and Alpine skiing. The Grand Resort Bad Ragaz consists of two five-star hotels, the Grand Hotel Quellenhof & Spa Suites and the Grand Hotel Hof Ragaz. Following extensive renovation work, the puristically designed Spa Tower was opened in 2009. The Spa Lofts and Spa Suites feature a contemporary design and each offer a private spa area with steam bath and whirlpool. Some even have their own sauna. Pure Ragaz thermal spa water flows from the taps. The highlight is the Penthouse Floor with an incredible 600 square metres area and all-round view. The resort fully lives up to its name: here legendary Swiss luxury hotel comfort is complemented with top-class quality standards, elegance and genuine hospitality. Guests can take their pick from a total of 289 rooms and suites furnished in different styles. Be it classic & elegant, traditional & comfortable, historic & princely or ultra-modern & puristic: every guest will find their own perfect holiday destination in the elegant Grand Resort, situated around three hours by car from Munich or one hour from Zurich. 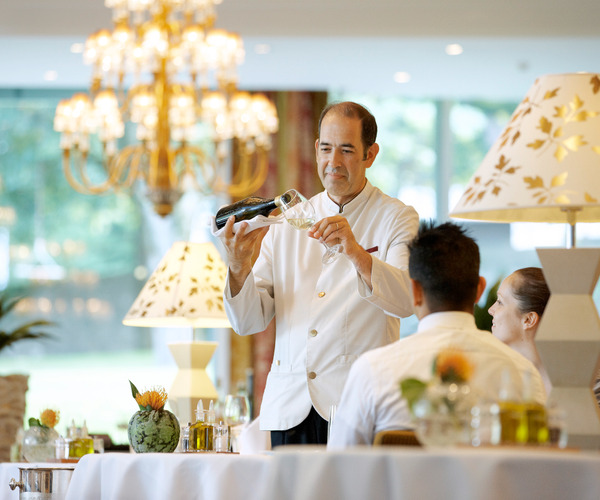 Guests of the Grand Resort Bad Ragaz can choose between no less than eight different restaurants. In the GaultMillau Hotel of the Year 2009 (58 GaultMillau points) they are spoilt with Asian, Mediterranean, Swiss and international delicacies. The gourmet restaurant Äbtestube has been awarded 1 Michelin star and 17 GaultMillau points and the Restaurant Bel-Air 15 points. Connoisseurs of fine food can enjoy Mediterranean cuisine in the suitably Italian ambience of the Olives d’Or. Swiss regional dishes are served in the Zollstube, while the new Asian restaurant Namun (13 GaultMillau points) indulges its guests with Thai and Chinese creations. Travellers can enjoy a laid-back evening in one of the bars or next to the warm open fire in the sophisticated Salon Davidoff.